The Knit Tree is a small family owned company on the outskirts of Redding, Californiaright at the tip of the Sacramento Valleysurrounded on three sides by beautiful mountain ranges. It is operated by David and Sharon Nani. It all began in 1970 when Sharon, as a young mother, received a knitting loom as a gift from her husband. The first item Sharon learned to make was the unique knit slippers which you can still find today in the showroom Bread and Butter Basics. As Sharon quickly became known as "The Slipper Lady" she realized what a wonderful opportunity had been given to her. She could add to the family income and still be at home to care for their two young children. The excitement grew as Sharon taught herself new knitting skills. Loving the mountainous terrain around her, it was only natural that ski sweaters, hats, headbands or ear warmers, and scarves started rolling off her knitting loom. Before long, local ski shops were taking notice, even some ski resorts. But there was a small challenge, these customers wanted a logo on their knits. Thus, in 1973, The Knit Tree was established as a "home based business" and every custom loomed ski apparel had a pine tree knitted in the corner. 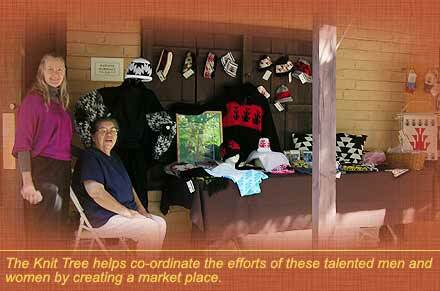 Sharon started attending Art and Craft Shows to market other knitwear items along with her ski apparel. 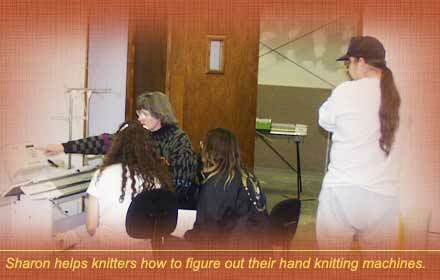 Sharon Nani teaching machine knitting at the Hoopa Indian Reservation. The news that someone actually knew how to operate one of these knitting looms, also known as hand knitting machines, spread. Soon, people were asking for instructional help for their machines. Sharon loved helping them figure out how to operate their individual knitting machines and develop patterns of knit items to make on them. >It was a very natural evolvement from knitter to teacher to writer to designer. Over the years, Sharon has become well known for her professional knitting technique articles and the Knitwear products that she designs for the national and international knitting magazines. She has written technical articles and designed and written both machine knit and hand knit patterns for Passap Model Book, Duet International, MacKnit, Machine Knit America, Knitting Machine Source, and Inknitters magazines. Check out the One of a Kind Category of the online catalog ~ where her published garments are offered to you as original and unique knitwear. "Sharon goes to an Indian Gallery show with Darlene Marshall of Design and Art"
So another evolution has taken place for The Knit Tree. The focus today is to co-ordinate the efforts of these talented men and women by creating a market place which had to incorporate knit products from the simplest to the most complex, each produced in a professional manner and the high standards expected from professional knitters. Some of Sharon's students that started out as Little Knitter's have grown up and are knitting more complex items and specialty knits of their own. In 2013, The Knit Tree added Crochet Critter's Crochet Critter hats and Hand Painted Autism Heart Puzzle knits to support Autism Awareness and Early Intervention. Today’s machine knitting community has availability of lots of used knitting machines on the market or individuals are inheriting a knitting machine.. Unfortunately, these knitting machines usually do not come with instruction. The new owner often goes to the internet community to find information on how to use their new equipment so they can have a new knitting adventure. To meet this need, Sharon has been adding the technical machine knitting articles that she has written for several knitting magazines over the past 40 years, to the article page of her web site. 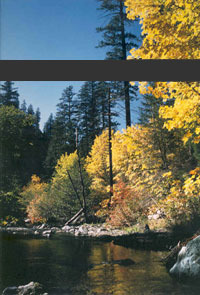 The articles must be converted from published magazine format to web page format. the older articles are being updated with digital photograph. So this is an ongoing project. Many students learn best by visual methods of instruction rather than written, so Sharon Nani's next goal is to fulfill this need for further visual instructional availability. Some of the basic knitting machine techniques will be offered as a short video on Machine Knitting Blog along with the written article. Sharon also feels the time has come to document her training program and machine knitting articles in a manner that would be beneficial for future generations. 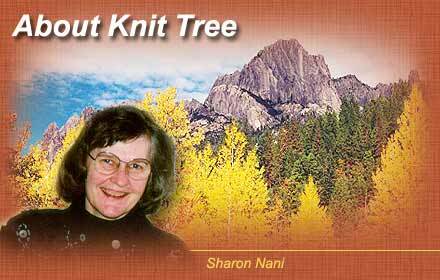 After the big project of converting the 30 years of knitting acticles for the Knit Tree's articles page, Sharon will be documenting her machine knitting programs and lessons on DVD’s. These Knitting Machine DVD’s will be offered for sale at www.theknittree.com as they become available. The Knit Tree web site online catalog offers you these elegant, creative, original and distinctive hand loomed knit items. It is the step that completes an essential part of the creative process and gives the opportunity for each individual knitter to receive a viable income from their efforts in their home based business or cottage industry.